Progressive Contracting Company — along with project partners the City of Sanford, Lee County, Sanford Area Growth Alliance and Gerald Traub Architecture & Design — won an Award of Merit for the Best Adaptive Reuse Project at the annual conference that drew more than 500 downtown professionals, elected officials, volunteers and consultants this year. Built in 1907 when the Tyson Buggy Factory in Carthage incorporated the Sanford-owned buggy-building business, the 30,000-square-foot facility was a workhouse for the local economy until the mid 1920s, when the automobile took off in popularity. After housing several industries for the decades that followed, the building sat empty for 15 years. But then community leaders and stakeholders had a vision for a one-stop shop for developers, making it that much easier to do business in Sanford. Progressive Contracting Company Inc. led the restoration/rehabilitation effort according to the National Parks Service Standards of Rehabilitation. Federal historic tax credits and North Carolina Mill credits were approved and granted for the $5.5 million restoration. 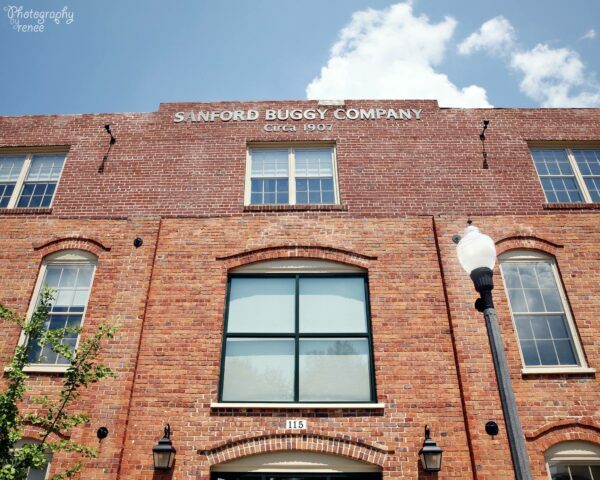 Today, Sanford Buggy Company is home to Downtown Sanford, Inc.; City of Sanford’s planning, inspections, code enforcement and historic preservation; Lee County GIS Services, environmental health; and Sanford Area Growth Alliance.